Navigation: Home » Investing » What if You Always Maxed Out Your IRA? What if You Always Maxed Out Your IRA? The Individual Retirement Account or IRA is an excellent tax free account available to many American workers. Unlike its cousin the 401(k), IRAs are completely portable and tend to have fewer restrictions on the number of investments allowed. IRAs are available to workers without access to a 401(k) or similar plan, and to workers with other accounts available up to a certain income. Even though IRAs have historically had smaller limits than 401(k)s, we wanted to ask: how big would your balance be if you always maxed out your IRA? You can find the complete history of IRA contribution limits on our site. As we did in the “What if you always maxed your 401(k)?” article, we had to make some assumptions to make this article reality. We assume you always were 100% in the S&P 500. We assume you started your account in January of the listed year, and divided your contributions evenly through the years. We counted all of the money you contributed, along with calculating an annual return and a final balance. Finally, we also assumed careers were 40 years long, which means the first three years of the IRA – 1974, 1975, and 1976 are a ‘complete’ calculation. Great! And what did you find about maxing your 401(k)? We found that for the three 40 year IRA account holding periods that have ended, you would have always had more than $900,000. Folks who started in 1975 and sold out of stocks in 2015 would have had a seven figure account, with slightly more than one million dollars – on only $107,500 in contributions! It was good news all down the chart, too: if you always maxed out your IRA and have had the account since 2003, we estimate your account is at least 6 figures. Since IRAs aren’t bound to a formal job, that means folks who are maybe 29-35 (and, yes, always maxed their IRAs) could have over $100,000 based on IRA contributions alone! Again, whether you chose a Roth-style IRA (where taxes are paid upfront but never again) or a Traditional-style IRA (where taxes aren’t paid until withdrawl), you are getting a great deal. Along with that tax benefit, your account itself also grows without the drag of taxes! What other IRA assumptions did you make? There are estimated fees paid, but taxes are turned off. See the calculator for details. March 2016 is the final date for 1977 and beyond. 1974, 1975 and 1976 end in January 2014, 2015, and 2016 respectively. 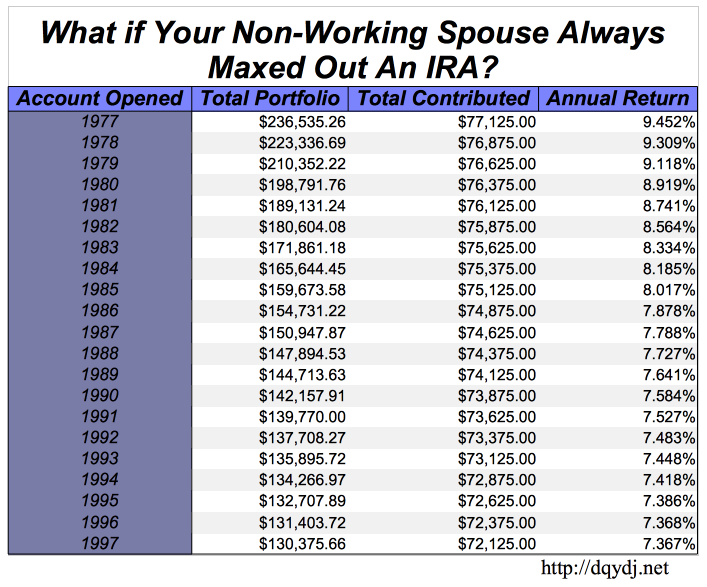 What if Your Spouse Also Always Maxed Out An IRA? This math is a little tricky, because the law used to treat a working and a non-working spouse separately. We’ll go over each scenario in kind so you can estimate the return! This is an easy scenario. In the above chart, add together the final balance estimate for when you started your IRA, along with when your spouse started his or her IRA. This is potentially trickier. If your spouse would have started maxing out an IRA after 1997 (1998+), just follow the instructions for the working spouse, adding the final balance for the two. This is because the rules changed, and non-working spouses could contribute to the overall maximum. Non-working spouses could not contribute in 1974, 1975, and 1976. 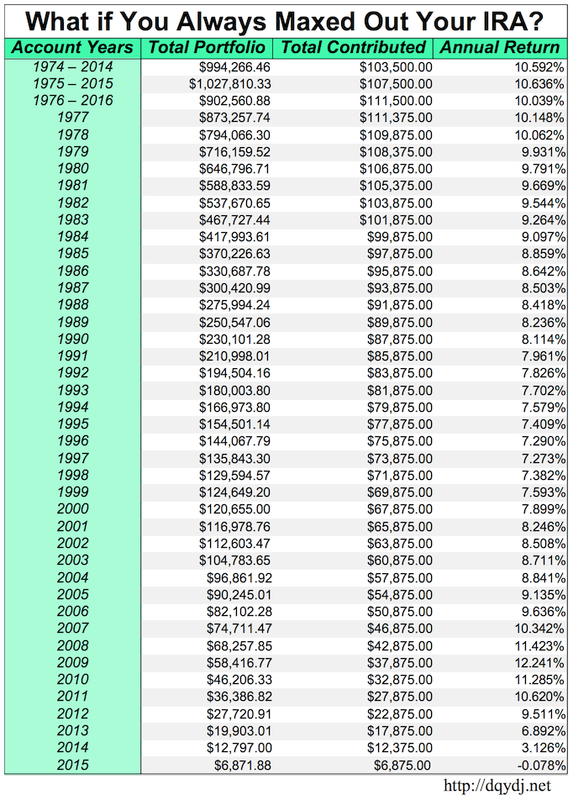 If your spouse was not working in those years but otherwise would have maxed out an IRA, use the 1977 final estimated balance in the below chart.The tricky part is this: from 1977-1997, the rules only allowed a non-working spouse to contribute $250 to an IRA. 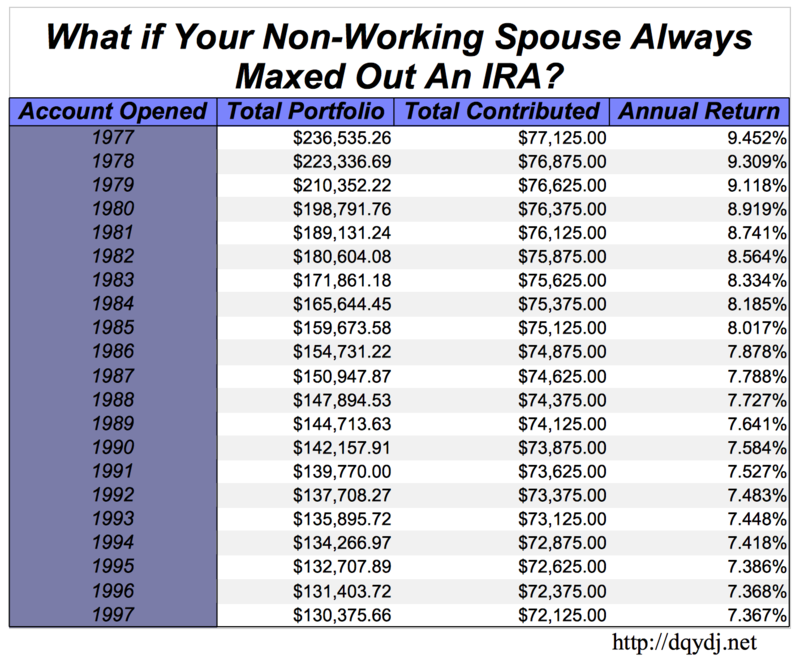 In the spirit of completeness, we also ran the numbers if your non-working spouse always maxed out an IRA, and they are presented below! For a spouse that would have starting maxing out an IRA between 1977 and 1997, we’ve run the numbers separately to help you guess what the amount would have been. Add the working spouse’s entry from the first chart with the non-working spouse’s from the below for a best guess! What if your Non-Working spouse always maxed out an IRA? The above results are only for a non-working spouse’s account. You should add the final balance together, but you can’t blend the annual returns – there are too many combinations, so you’ll have to run the math on the S&P 500 yourself. What Did We Learn From the Maxed Out IRA Study? IRA started in January 2009 and always maxed out returned an estimated (and whopping) 12.241% annually so far! In every time period, starting an IRA and always maxing it out was an excellent financial move! On this site, we’ve argued forcefully to always maximize your retirement funds – and this study only furthers the case for cranking your savings up to the max. Even in the worst case, 1997, an always maxed out IRA still would have returned over 7.273% a year… a very good result, which you could have attained by merely buying and holding an index fund. And that strategy is often best for the common investor. While we wouldn’t suggest staying 100% in stocks (especially a mere 500 stocks from a single country), passive portfolios work best for the vast majority of people looking to save for retirement. With that in mind, you shouldn’t try to beat the above numbers… consider them an investing ideal and a theoretical (not to mention just a guess!). I hope this was still illustrative and convincing, even with the caveats and assumptions. Let us know what you think in the comments! Have you always maxed out your IRA? Even if you haven’t, how does your balance compare to the above chart? Are you going to max out your IRA from 2016 on-wards? Great advice. I’ve been procrastinating on getting my IRA set up, but I think I’m going to actually do that today. There is still time before the deadline to count it against last years taxes I think. Is this inflation adjusted? For example, if I opened an account in 1997, is every year’s contributions adjusted for the inflation that contribution year? I can’t give an easy answer since there are really two here – the returns themselves are nominal but with dividends immediately reinvested. However, IRA contribution limits have increased over time, and are now tied to inflation. So, in a way, contribution limits are inflation adjusted.